Over the years, app management has been greatly improved with the addition of folders and other features that make having lots of software installed on a device a breeze to access. Yet, don’t you wish there was a way to launch an app by tapping an icon but be redirected to an app of your choice instead? This is where this awesome jailbreak tweak comes in. Still confused? Don’t worry, I was too at first. OpenOther+ allows users to assign a certain app icon to a completely different app, for efficiency’s sake. For example, if you use the TweetDeck app for your Twitter needs but you’d like to launch it by tapping the Twitter for iPhone shortcut instead, OpenOther+ makes it possible to do just that! As you can tell from the video below. OpenOther+ doesn’t change the look and feel of the device, nor does it add any icon to the home screen: in fact, it’s completely invisible unless used. Making your own shortcuts, however, couldn’t be simpler: just press and hold any icon and tap on the one you plan to use as shortcut, then simply navigate to the icon of the app you want to point your shortcut to and tap on it. That’s it. In order to install this tweak, you first must jailbreak your iPhone, iPod touch or iPad. You can follow our step by step guide posted here to jailbreak your iPhone, iPad or iPod touch on iOS4.3.5 using Redsn0w (or PwnageTool), or on iOS 4.3.3 using Redsn0w, PwnageTool, Sn0wbreeze & JailbreakMe (that last one being the easiest). Before going on, make sure you’re familiar with basic diagnostic tasks in iOS devices, like entering DFU mode and performing a restore through iTunes, should anything not go as expected. 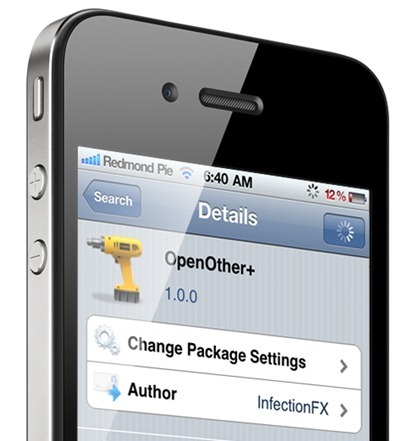 OpenOther+ is available on Cydia from the BigBoss repository, which should be already enabled by default. In order to install this app, simply search for OpenOther+ from within Cydia and tap on the first result. This tweak will set you back $1.99, not bad for a tweak that saves you time for launching apps. For this price, it’s up to you whether you think it’s worth it. With so many shortcuts, and no clear way to keep track of them, a confusing experience might be created over time. Yet, if you’re confident you can manage it, OpenOther+ might be a good investment.